This is a lovely attractive antique Victorian silver plated tantalus with three cut glass decanters and stoppers, circa 1870 in date. 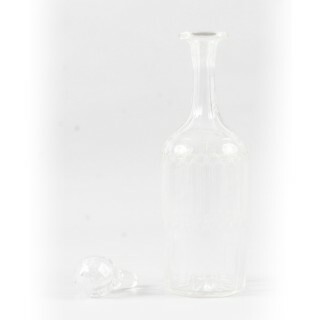 The cut glass decanters feature oval and beaded facet cut linear decoration with facet cut stoppers. 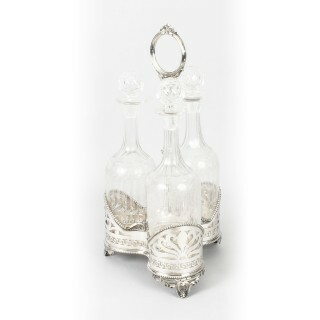 The silver plated decanter holder has a central stem with circular loop handle and the three decanter wells feature beaded pierced Greek key foliate decoration. 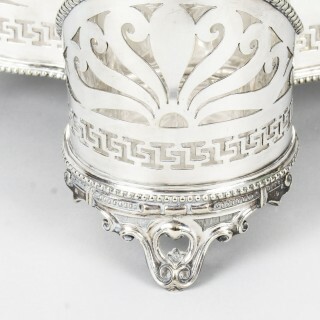 It is raised on three pierced scrolled supports and is numbered 1402 on base. 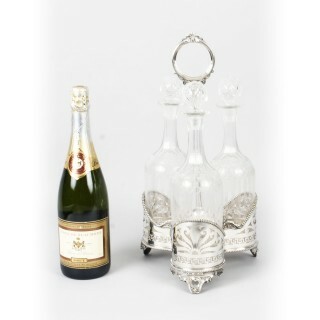 The craftsmanship is second to none and this beautiful tantalus is sure to add an elegant touch to your next dining experience. 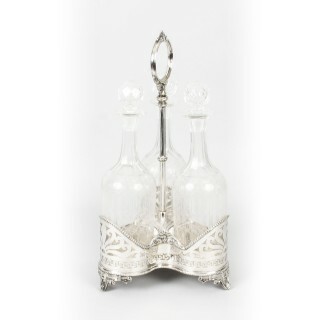 Tantalus is a type of liquor decanter in which the bottle stoppers are locked down tightly by a metal bar. 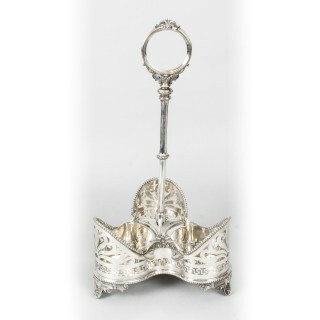 This was to prevent the theft of the contents by servants. 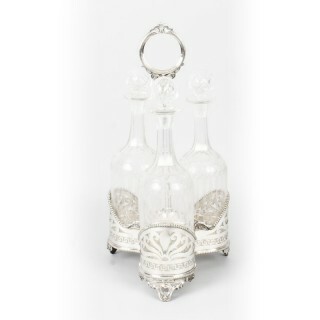 Like the name suggests, the decanters themselves are visible, drawing temptation while unattainable. A key is required for entry. 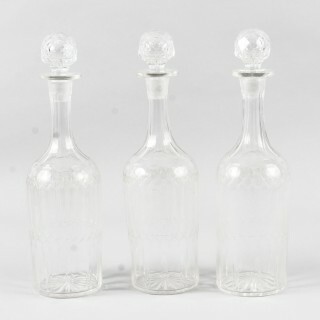 The most common types of tantalus holds three bottles or decanters while there are also smaller types housing only two. There are many different forms of tantalus. 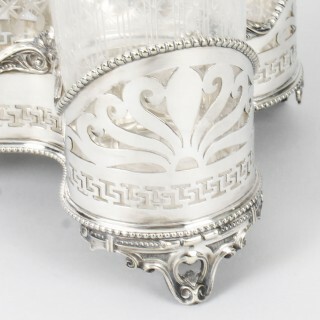 Often the encasement has metal handles on both sides and ornately carved decor. 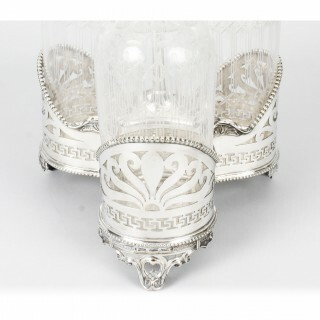 Crystal and metal versions are also a beautiful option when choosing a tantalus. 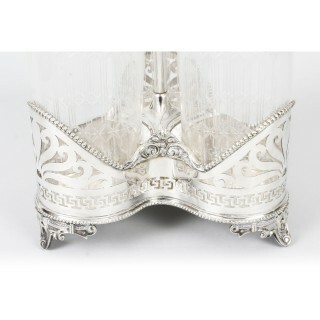 Tantalus derived its name from the story of the mythological Greek king, Tantalus. To be tantalized is to be tempted with the unattainable, and the king, condemned to an eternity in Hades, was sorely tested. 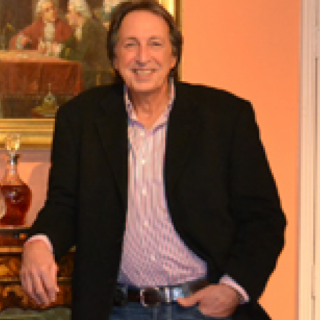 He was forced to stand forever in water that, when he bent to drink, would recede and to gaze upon foods he could only reach for and never grasp. 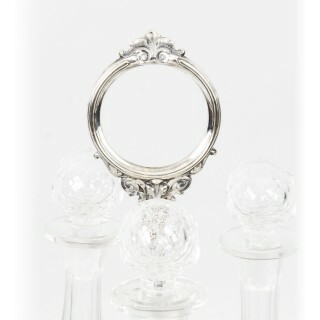 The 1800s saw our Victorian predecessors apply the King’s name to the lockable decanter.